What is a DAF unit? DAF stands for Dissolved Air Flotation. DAF is the central principle of a best practice wastewater system used when grease traps are inadequate. A DAF unit is a specific section of a multi-component wastewater treatment system. The DAF unit role in the system is to control and pre-condition the wastewater for optimum DAF operation. The central idea behind the DAF unit is that micro-fine bubbles of air are produced in the unit, which combines with insoluble contaminants in the wastewater, lifting them to the surface, where they can then be scrapped away. Unlike, the standard grease trap flow-through-box method which uses standard gravity separation technology, DAF units can achieve superior results at a higher flow and contaminant loadings. Here is a diagram and explanation, from SA Water’s DAF Trade Waste Guideline, on how the DAF unit works. When do I need a DAF unit? Basically, a DAF unit is required if your circumstance dictates that a simple grease arrestor would be inadequate at maintaining the regulated trade waste discharge quality. SA Water outlines that retail activity and industrial activity of the following nature requires DAF units. If the combined trade waste activities (e.g. large food service area, shopping centre, food court) have a grease trap capacity requirement calculated to exceed 12,000 litres. Note: use the indicative sizing methods and rules given in the Trade Waste Commercial Food Preparation and Service Guideline to find your required grease trap capacity. In most industrial processes (including food manufacturing), there is a higher volume of waste produced. The higher loads, flows and temperatures of industrial waste mean simple grease traps cannot do a satisfactory job of separating the solids from the liquids. Therefore, DAF units are required to treat industrial trade wastes high in solids, grease and insoluble Biochemical Oxygen Demand (BOD). For more information regarding the rules and regulations surrounding DAF units, see the SA Water’s DAF Trade Waste Guideline. Each DAF system will come with manufacturer’s recommendations regarding the maintenance frequency of all system elements. We strongly advise you to contract an experienced liquid waste management service to conduct maintenance in accordance to your manufacturer’s specifications. The liquid waste service can then instruct whether a more frequent maintenance would be required in the future. 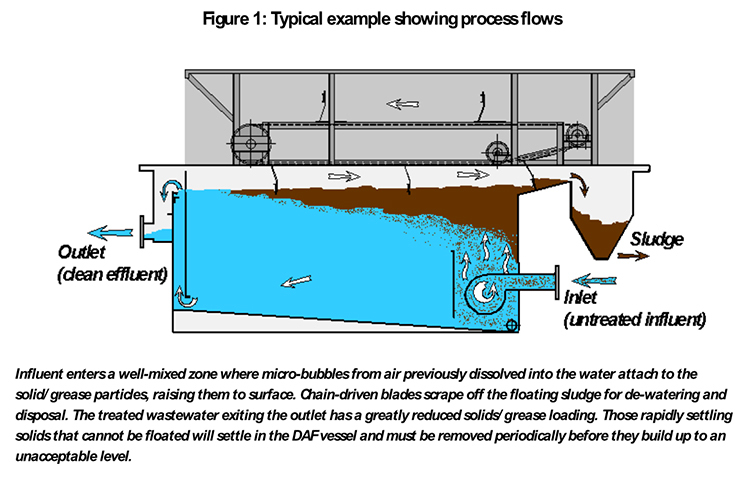 To prevent sludge build-up and poor microbubble formation, the DAF unit should be periodically drained and cleaned. pH probes should be calibrated monthly and cleaned weekly as a minimum. To prevent the carry-over of large solids or sharps into the DAF unit, screens should be periodically cleaned. Nitschke Liquid Waste are experts with over 20 years’ experience in the waste industry. If you have a DAF unit that needs maintenance, Nitschke is the friendly, cost-effective professional for you. We will service and clean the necessary parts of your DAF unit, and make note of when your next clean will be due so that your DAF unit is always taken care of. If you would like to know more about our DAF Unit maintenance service call us on 08 8260 7660 and we’ll be happy to talk about your specific circumstance.